Make an appointment for a physical therapy evaluation today! You are a healer ~ when no one else could help! Surprised at how much I enjoyed coming here for physical therapy. I was in incredible pain, now the pain’s gone! Can’t thank you enough. After my knee surgery, I was back in action quicker than I imagined with the help of you physical therapy – thank you! Was injured at work, bad back sprain. After only a month of PT sessions with Jason, I’m working again. After I injured my Achilles I figured my running days were over. 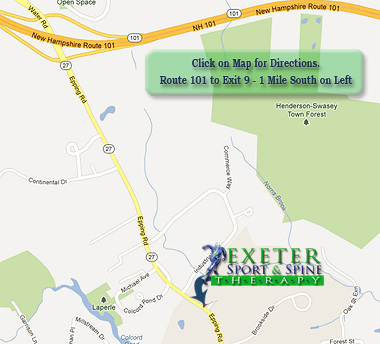 Thanks to Exeter Sport & Spine, I’m now training for a 1/2 marathon! Physical therapy was the key to getting me back to coaching my son’s soccer team again. You are a healer ! when no one else could help! Surprised at how much I enjoyed coming here for Physical Therapy! Have you ever gone for PT and been given instructions on how to do an exercise and left alone to do so? Doesn’t happen here. These very knowledgeable therapists give instructions, demonstrate, observe and monitor. The atmosphere is relaxed and friendly.